Valve Mechanism means simply the sequence of operation of opening and closing of the valve. 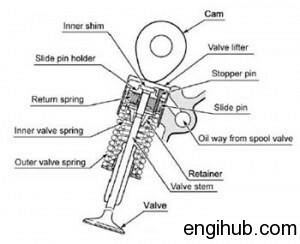 All mechanical engineering or automobile engineering people must have the knowledge of valve mechanism. Hence I will like to share some information, hope you like it. In a four-stroke internal combustion engine, the “Poppet Valve” performed the opening of the cylinder to inlet or exhaust manifold at the correct moment. Generally, the face of the valve is ground at 45 degrees but in some cases, it is also ground at 30 degrees. It is not important to have a same angle of the face in inlet and exhaust valve of same engines. So, to make it in the right order, the valve may be reground after some use. There is some margin provided to avoid sharp edges. The groove, retain the valve spring which aids in keeping the valve pressed against the seat when closed and thus seal the combustion space tightly. In a closed position, the valve face fits the accurately matched ground seat in the cylinder block. Generally, replaceable ring inserts are used for exhaust valve seat. The inlet valves are made from plain nickel, nickel chrome or chrome molybdenum. Exhaust valves are made from nickel chrome, silicon chrome steel, and high-speed steel. And also from stainless steel, high nickel chrome, tungsten steel, cobalt chrome steel. 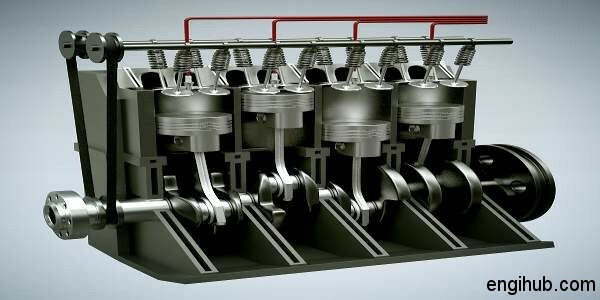 So, with the help of these parts, valve performs its operation very accurately in an internal combustion engine. The cam actuates the movement of the valve through the tappet. Hence the replaceable valve stem moves up and down in the valve stem guide. This movement is obtained by rotation of camshaft and cam, which generally runs at the half the engine speed. The valve spring, keeps the valve pressed against its seat and ensure a leakage-proof operation and also bring back the valve very quickly during its closing. When the engine is started, it gets heated up gradually hence causing the valve stem to expand. A valve tappet clearance is always provided to allow the expansion of valve stem and also other parts. This clearance value depends upon the length of the valve, its material and the operating temperature of the engine. The tappet valve clearance can be adjusted by rotating the adjusting screw. Where adjusting screw is not provided to vary the clearance, it can be increased by grinding the bottom of the valve stem and face or also by using the longer valve. Due care must be taken because even a slightly insufficient clearance may lead to the valve not properly resting against its seat as the engine gets heated causing increased noise level and loss of power. The clearance provided in exhaust valve is slightly more than that of the inlet valve. This is due to slightly more expansion in exhaust valve because of higher temperature of hot exhaust gases produced during combustion. In this valve mechanism, a push rod and a rocker arm, to push the valve against the spring pressure are required. The rocker arm rotates about the rocker arm shaft under the force exerted by the push rod. The clearance in this valve mechanism is kept between the rocker arm and the valve stem. This can be adjusted by the screw adjuster also. A suitable gear train or chain is provided to convert the drive from crankshaft to camshaft. In high-speed engines, the frequency of vibration of the valve spring coincides with the normal operating frequency of the valve hence leads to resonance and increasing the surging effect. To overcome this problem, nowadays compound spring is used. Compound spring means “One spring within the other of different natural frequencies”.